5 Starr Music Products is the manufacturer of the highest quality lubricants for trumpets, trombones and all brass valve instruments. 5 Starr Super Valve Oil is available in clear, blue, and red. An ideal lubricant for trumpet, trombone, and all brass valve instruments. It is highly recommended by players and repair techs alike. 5 Starr Valve Oil is unsurpassed for smooth long-lasting trumpet valve lubrication. If you can find a better oil, we’d like to see it! For a superb all-purpose brass instrument slide grease, try 5 Starr Lube-All. 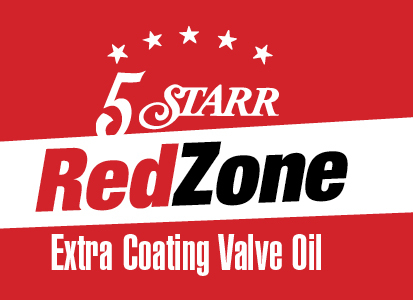 We are excited to announce RedZone, a new powerful valve oil with extra coating power.